While I haven't been doing many audio book reviews lately, I actually do "read" books every day during my morning run. Of course, it's only about a half hour at a time so I don't read audio books at anywhere near the same pace that I do print ones. But because it's June and officially audio book month, I decided it was high time for me to catch up on some of my audio book reviews. 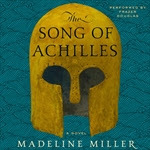 The first one I decided to share is THE SONG OF ACHILLES by Madeline Miller. This audio book was nothing short of amazing! Most of you already know that THE SONG OF ACHILLES was awarded the 2012 Orange Prize for Fiction, and not that this means anything, but I can certainly see why. THE SONG OF ACHILLES is at its simplest a retelling of the Trojan War; however, it's so much more than that. It's also a beautiful love story about the complex relationship of Achilles and Patroclus. When I decided to read THE SONG OF ACHILLES, I was afraid that I didn't have enough background knowledge on the Trojan War or the Iliad to appreciate the story. This next part is a little embarrassing to admit... but rather than research these things prior to picking up the book, I decided to just listen and see what happened. It turns out that I had absolutely no problems following the story, and I was surprised to find that I actually knew more about the war than I first thought. As I listened to this novel, I discovered many familiar stories and characters; and I have to say that I think the author did an incredible job of incorporating the classic parts of the Iliad with her re-telling. It was only after I finished listening to the book in its entirety that I went back and researched the Trojoan War and the Iliad; and I was even more impressed with Ms. Miller's writing and creativity. THE SONG OF ACHILLES was told through the eyes of Patroclus, a relatively minor player in the Iliad; and I think that was a very wise move on the part of the author. By using a character that wasn't a well-known, she was able to bring new insight to a popular story. In addition, I thought she did a marvelous job of bringing Patroclus to life and making him a very real, and very likable, character. I especially appreciated seeing Achilles and his actions through Patroclus' eyes and I thought their relationship and love affair were fascinating. I am still a relative newbie to audio books and I never feel like I'm experienced enough to review the quality of the narrator. But in the case of THE SONG OF ACHILLES, I adored Frazer Douglas and he definitely brought this book to the next level for me. Needless to say, he is new narrator to me (but that's not saying much!) and I thought he did an outstanding job. His voices and accents were terrific, and I have to wonder if I enjoyed this story even more because I listened to his interpretation of it. THE SONG OF ACHILLES would make a wonderful book club selection. Not only is the story interesting, but the characters and their relationships are so complex. There is a reading guide available which has eighteen thought-provoking questions. Some of the things you might want to explore include the various characters and their motivations (namely Achilles and Patroclus), destiny vs. free will, loyalty, love, and honor. It's difficult for me to express just how wonderful this novel truly is. It's true that the Iliad is one of the most famous stories of all time and I wasn't sure that a re-telling would be my cup of tea. However, I am so glad that I gave this book a chance because it exceeded all of my expectations... especially for an audio book. Highly recommended! Thanks to the publisher for providing a copy of this audio book. Oh, awesome this is one of my favorite stories so I'm glad it was done well. Guess I'll be checking this out, soon! I actually think a book like this might be better on audio than print. I tend to stumble over names like Patroclus when I'm reading and think it would be great to have a narrator who knows how to pronounce it correctly. I'm so glad to read you had no problem in spite of insufficient background because I would be in the same boat! I've heard great things about this book, but have still been hesitant because honestly - the Iliad was one of the most painful reading experiences of my college career. I'll have to make a note to hunt down the audiobook if I can. Yay!!! I haven't listened to the audio, but I'm with Kathy. I often choose to listen to a book that has a lot of foreign terms or names in it because I like hearing the correct pronunciations. I agree, Frazer Douglas was amazing!